If you’re a veterinary practice owner, your practice is probably like your baby. You were really excited when you found out you were going to be a parent (a practice owner). As soon as your baby was born (you actually stepped into the ownership role), you quickly realized how hard having a baby (a veterinary practice) really is. You’ve trusted your gut instinct when it comes to parenting (practice management) decisions ever since. But owning and managing a veterinary practice is quite different (the most successful in our profession might even say it’s better—shhh, don’t tell the kids) than trying to raise a child. If you’re going to be successful as a practice owner or manager, you can’t rely on your instincts. Here are four reasons why you should be managing your practice with metrics. Data doesn’t lie. It tells the real story behind the state of your practice.Think about it: Imagine your data revealing that one doctor is generating far less revenue than the other doctors in the practice. You can use that data to identify inconsistencies in patient care, poor time management, discounting, lack of confidence, and more. Once the problem is identified, you can use the data to back up your decisions regarding personnel, and bias will not come into play. 2. Data gives credibility to leaders. When leaders want to implement change, it is better to back it up with data and statistics. Think about it: If your data shows that preventive care exam revenue has decreased by 15 percent over the past year, despite a 2 percent increase in the cost of exams, you can use that data to justify setting a standard surrounding preventive care exams in your practice. How and when will preventive care exams be recommended? What will always be included in the exams? How will the team communicate with clients about preventive care? 3. Data is the measuring stick behind change. When teams can see the data to support the need for change, they will be more likely to embrace new standards, protocols, and strategies. Think about it: By surveying your clients or team, the results cannot be denied when the majority’s answers are the same. For example, if 85 percent of clients surveyed said the exam-room wait time is too long, the exam-room wait time is too long, and leadership needs to implement changes to correct the problem. When the team sees the survey results, they’ll be more open to the proposed changes. 4. Data removes the guesswork. By using metrics, leaders will know exactly what they need to focus on in order to improve the practice and the team, no guesswork needed. Think about it: A veterinary practice should aim to add 25 new clients per full-time veterinarian each month. If you have a three-doctor practice, and your data shows that you’re only adding 50 new clients each month, you’ll know that you need to focus on marketing your practice in your community to bring more new clients through your doors. In turn young graduating veterinarians are less interested in saddling themselves with more debt, to work long hours in an industry where revenues are beginning to be “capped” out. It’s easier for them to go corporate than have their own place. Meanwhile Baby Boomers are selling off their practices. All the big, high end, successful veterinary practices are being snapped up by the corporate consolidators. With the efficiencies of corporate ownership there won’t be any room for large, privately held veterinary clinics. This is the elephant in the room that nobody is talking about. In the future the only private practice that will prosper and grow will be the distinctive and unique, well run, and well positioned small private veterinary practice. 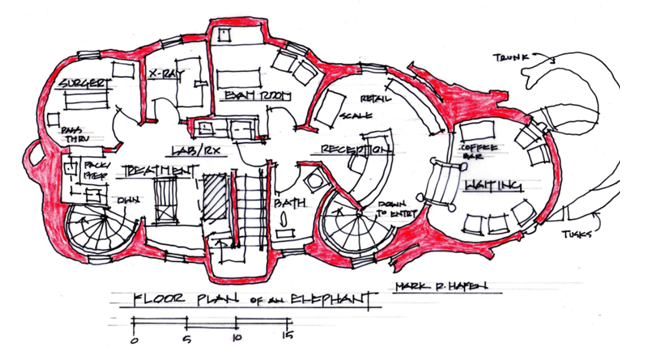 So, in response to the elephant in the room I have set out to design a veterinary small clinic… in an elephant. In Atlantic City, New Jersey stands Lucy the Elephant, one of the more unique roadside attractions in the States. She was built in 1881 by James Lafferty who hoped the elephant would entice visitors to come, see, and buy property in his new ocean side resort.Standing six stories tall, weighing 90 tons, covered with 12,000 square feet of sheet tin, Lucy was more than an object of awe -- she was a functioning real estate office. Lafferty would take potential clients up in the “howdah” (the seat on top) to show them the view and hopefully pick out the lot they would buy.She was never a veterinary clinic. That is not until I decided to imagine what it would be like to build a veterinary clinic in Lucy, the elephant.Ok, ok, work with me on this. This may a tad over the top, but I’m trying to make a point. 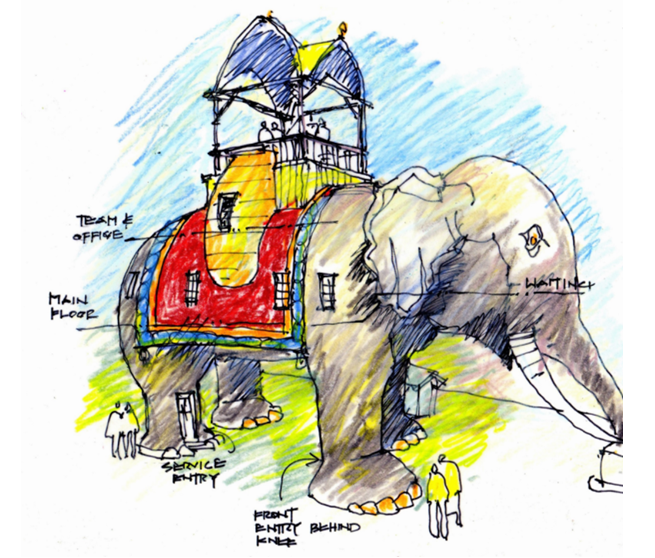 A veterinary clinic in an elephant would stand out head and shoulders above your competition. It would be a readily identifiable landmark in your community. Everybody would talk about it and know where it is, and isn’t this what you want your veterinary clinic to do? If I can show you how you could actually fit a very workable, efficient, effective veterinary clinic inside the 90 ton behemoth, then maybe there is a lesson learned. Namely that there are a lot of overlooked places where a veterinary clinic could fit. You just have to use look! Let me take you into the belly of Lucy -- to see the clinic. Getting out of your car, you walk up to Lucy. Her grey bulk looms over you. Her trunk is immersed in a giant bucket of water. It looks like any minute she may spray you. You walk up to the giant elephant toes with foot tall elephant toenails. Stepping around behind her knee you swing open the door on the backside of the front leg and mount the spiral staircase. Fifteen feet higher than where you started you arrive at the level of the working veterinary clinic. More stairs lead up to the waiting area stashed inside Lucy’s cranium. You can peer out her eyes, her tusks visible below. Turning you are greeted by the receptionist. Following along what might be described as Lucy’s alimentary canal you are ushered into the single exam room. A window looks out through the blanket on Lucy’s back giving you a view to the street far below. Next door the lab/pharmacy and charting area is combined with the treatment room which includes a 4 foot tub table and a bank of cages. On the left side of Lucy, maybe about where her kidney would be, is the x-ray room. Inside Lucy’s ample left rump is a fully functioning small surgery suite. In her right rump down a staircase to Lucy’s groin is a utility room with washer/dryer, a tub and two dog runs. From there you can exit her left leg by way of a spiral staircase. Turning back to the treatment there is another staircase which leads up to the “howdah” where a combination doctors’ office and team room is located. And just like in Lafferty’s time doctor and staff can look out at the Beach beyond. You see it can be done. Granted it is not the most efficient veterinary clinic you’ve ever seen and there are a way too many stairs to climb up and down, but it is possible. If I can make an elephant into a workable veterinary clinic then you should be able to find an under-appreciated, unique, maybe even challenging lease space or property to buy that you too could make into a veterinary clinic. If the industry is going to continue to grow and prosper, we are going to need to confront the elephant in the room. And if it takes building a clinic in an elephant to do that, then have at it. I recently read an Inc article ‘Your clients don’t care where you went to college’. I had to agree with it! Clients care about your competence not your credentials! I don’t need to see my doctor or dentist’s degree to know that they have one. If you are employed in veterinary practice, clients already assume you have the qualifications. Will you care for their pet? A common mistake I see in our industry is veterinarian’s taking more CPD and more courses, thinking that clients will listen to them and respect them. Of course, it’s important to keep growing your knowledge and skills. However, if clients aren’t listening to you now and following your recommendations, it isn’t due to a lack of credentials. It’s a lack of respect. They don’t believe you. They may not trust you.They may not like you. Why does this occur? It is usually due to communication skills. You may be using too many technical terms and clients don’t understand you. A confused client will always say No. Clients may not feel listened to. They may feel judged. You may be under time pressure and appear to rush the client. You may make the client nervous so they don’t give you the full story. Good and effective communication is an essential skill in practice. If you have to tell clients ‘I know what I’m doing’, it sounds arrogant. The only time it’s ok to say this is if you are reassuring a very worried client and the tone you use conveys confidence and warmth. How do you communicate to clients your competence and experience? Confident communication is essential, both verbal and non-verbal. You have to believe in yourself, your knowledge and what you are discussing. If you don’t, it will show in your body language. Discuss previous cases that you’ve seen and the positive outcomes you had. Listen to clients and validate their concerns. A client who feels they are listened to will trust you. Keep clients informed and follow up with them. The client will feel valued. We are in a service industry. Clients are paying for a service and a result, in my 17 years of practice, I have noticed a shift with the general public. If the title of this post offended you and you need to be liked by clients to feel appreciated in this profession, you will be disappointed. You will encounter incredible clients who really appreciate what we do. However, what will kill your happiness on a day is that one client who was rude and horrid! That’s why it’s important to have a life outside of practice that brings you joy and satisfaction. It will help on those hard days! In one, the other person was seemingly complaining about a situation and I didn’t understand why. As a result, I believe my comments lacked empathy. In the second, the person was lamenting their situation and I offered what I thought were helpful suggestions. Upon reflection, I realized that in both instances, it would have been helpful (for me and the other person) to ask a few good questions. With a thoughtful question, I could have been a better listener and uncovered their feelings. Sometimes people just want to be heard and know we care.The beauty of asking good questions is that it helps us build trust with clients and team members. It helps us better understand the motivations behind people’s behavior. And it may even help us motivate them to take specific actions. Inquisitive, caring individuals ask questions so they can gain information and enhance relationships. In veterinary medicine, teams ask many questions to gather information but sometimes are lacking in the art of asking questions as a means to engage clients and build rapport. Once you are in the habit of routinely asking questions, try to be mindful of what a “good” question is. We all know questions about a pet’s medical history and client preferences are important. But we often miss opportunities to ask questions that help us connect with clients and team members in a more meaningful way. “What concerns do you have about Sophie’s treatment plan? Asking good questions help to make sure people feel heard and helps us better understand feelings and thoughts that drive behavior. When you are thinking about ways to improve your business and meet your bottom line, you might not think about social media as the way to go at first. However, there is nothing more important for a business in the 21st century to understand than the fact that social media is the name of the marketing game. Without social media as part of your digital marketing strategy, there is no way that you’re going to succeed. There are thousands of potential customers on social media networks who are just waiting to hear about your business. And if you don’t get out there and engage with them on social media, then your competitors are going to be the ones who do. That means tons of lost potential business for your company. The first thing that you’ve got to understand about social media is that not everyone is going to be interested in your product. There are just going to be people who are not in your right target audience. Your marketing team needs to first understand what your target audience is and then you can go on to figure out how you’re going to reach them. For example, if you are selling outdoor camping equipment, why would you be targeting those people who are not interested in camping or who can’t get out and camp? Narrow down that target group and then everything else about your strategy is going to flow from there. In fact, did you know that you can specifically target your audience through advertising on social media networks like Instagram and Facebook? Through their advertising functions for businesses, you can write that you are only targeting people in a certain location or who have certain interests. Then, you will be able to show your content to thousands of people in your target audience. When you start doing work on social media networks and generally online, you are going to naturally start getting online feedback from customers. People will start engaging with your content, speaking about your products, and letting you know about the things that could be improved or those things that you’re doing well. Don’t just ignore these comments that people leave! This is going to tell them that you don’t care about what they have to say and that you would rather not take their opinions into account. Engage with every single person who comments on your content or who leaves a review about your business. This is going to ensure that they stick around for the long-term and you start improving the reputation of your company. Make sure that your marketing team knows what kind of content that your audience enjoys seeing. Then, your content creators can focus on articles, photos, or videos that will work for your particular audience.And there you have it! Working with social media marketing is something that every single business should be focusing on in the 21st century. There are thousands of potential customers that you’re going to be neglecting if you don’t!